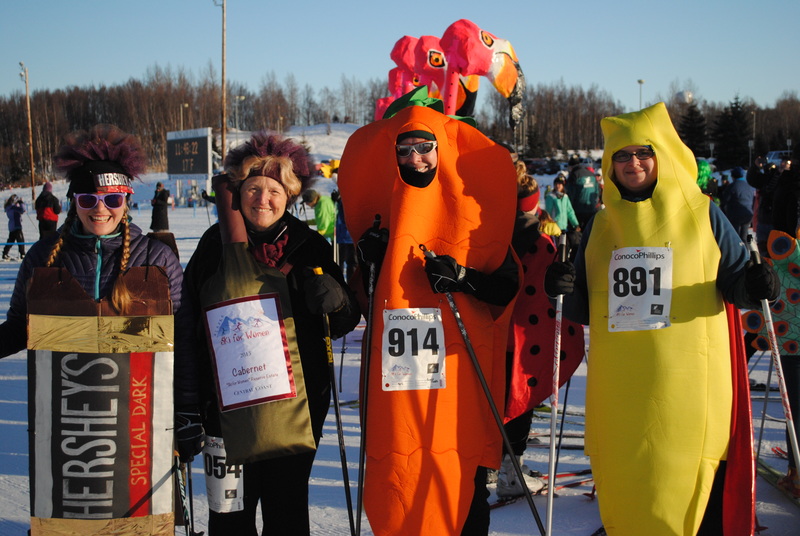 Join in the fun at the colorful Alaska Ski for Women (ASFW) – North America’s largest women-only cross-country ski event. 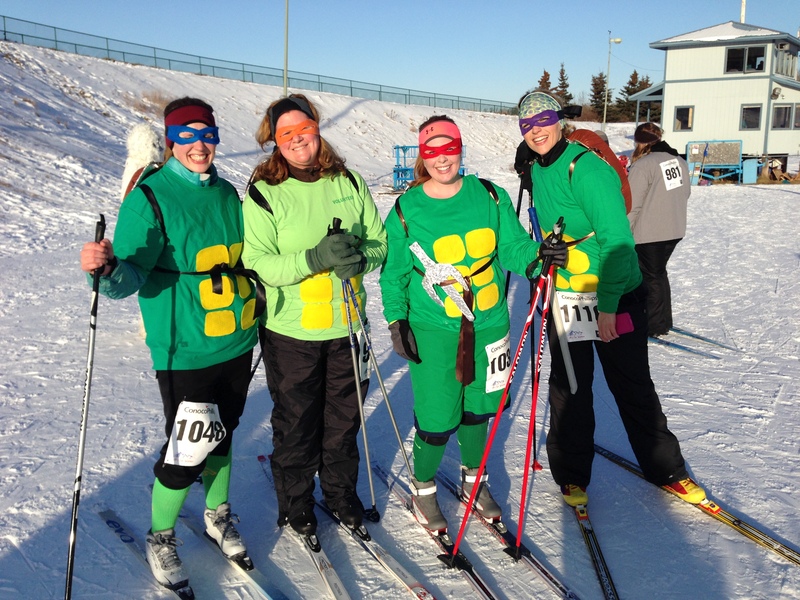 This is a great event where women of all ages and abilities come out to ski approximately 2.4 miles (4K), many in colorful costumes, while raising funds for local non-profit organizations that help stop the cycle of domestic abuse against women and children. This is not only a FUN event, it’s also a FUNDRAISING event! Through the generous donations of ASFW participants, and the hard work of our volunteer committee, the race has been able to make an impact in the community by contributing over $1,000,000 to groups that actively work to improve women’s lives. A special focus is ending the cycle of violence against women and their families and to help women in crisis find positive solutions to a healthier life. 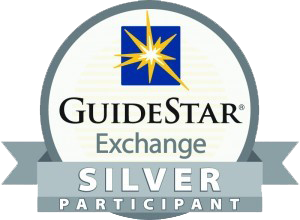 See our grants page for the list of current fund recipients. Please continue to give generously with the assurance that 100% of the net proceeds are dedicated to improving the lives of women. Please join us in thanking and supporting our 2019 Alaska Ski for Women sponsors listed below. We wouldn’t be able to have such a quality event nor would our beneficiaries receive critical funding to help stop the cycle of domestic violence against women and children. 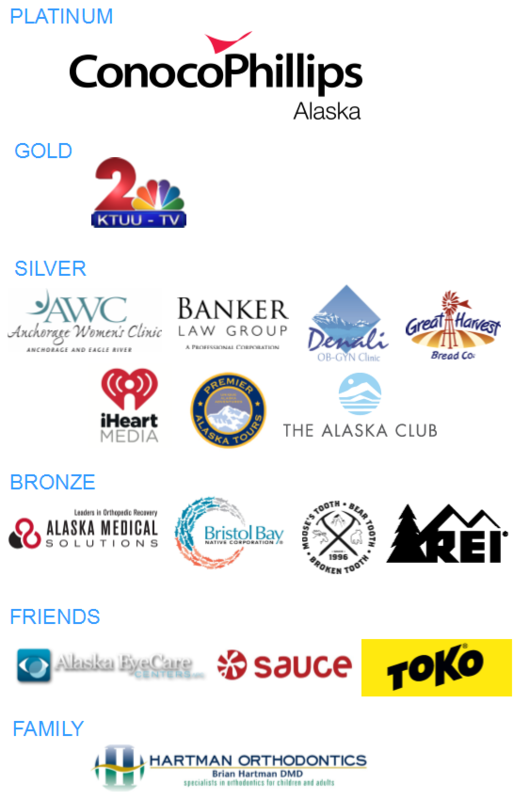 Thank you to our Alaska Ski For Women Sponsors! Special Pricing on REI Ski Rental for ASFW skiers! Two day discounted REI ski rental available to ASFW participants, starting Friday during bib pick up: $23 for a skate package and $15 for a classic package. Thank you to our generous sponsor, REI! Note about changes: If you want to change races or made an error in your registration, please do not register again. 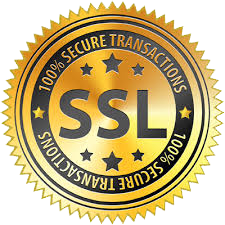 Email admin@anchoragenordicski.com and we will correct your registration. Scholarship/Donation waivers available: To request an entry scholarship, please email alaskaskiforwomen@gmail.com. *Note for teams: team members can do any race they’d like. All team members do NOT have to race together or in the same race. The Skate/Freestyle Race – For women who use either skate or classic technique. There will be one timed wave (skiers will self-seed, faster at the front, slower at the back). This race qualifies for the Triple Patch. The Classic Race – For women who are using the classic (Diagonal) technique. Everyone will get a timed result. There will be one timed wave (skiers will self-seed, faster at the front, slower at the back). This race qualifies for the Triple Patch. Duathlon combined 8K – This 8K event is geared to those that want extra bragging rights! New this year: the Duathlon will be a traditional duathlon; participants will start with the first wave of the Skate Race then upon returning to the stadium will switch their gear in the transition zone and ski the course again with Classic gear (i.e. there is no break between races). If a skier wishes to use the same skis for both the skate and classic, they must step out of their binding and step back in within the transition zone. The transition zone will have blue fencing to layout gear. The total time: skate leg, transition, and classic leg will be the skier’s race time. 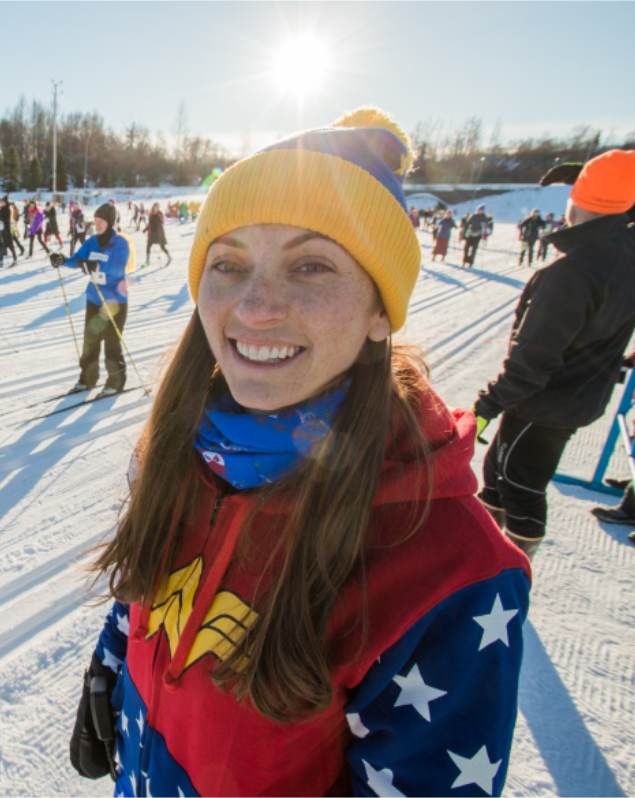 The skier with the best time will be named the Alaska Ski for Women Race Diva. Duathlon participants must register for the duathlon division. Duathletes will be designated by their own bib color. This race qualifies for the Triple Patch. After racing in the timed event, you may also participate in the party wave. The Party Wave – The Party Waves start at 12:15 pm following the costume parade and contest. This non-timed event is just for fun. There are no times calculated and results posted. The Party Waves are for those who are out to have fun on the trails. The goal is to enjoy your trail-mates, take in the various costumes, and have a great time. Since the pace is slower, check with your partner or team to determine which event best fits your competitive desires. If you have women in your group who are competitive and want to do the timed events, there is time for them to race and then join the Party Wave following the costume parade. The Party Wave qualifies for the Triple Patch. Preview Auction items and buy event merchandise before it’s all gone! Kick Waxing Kick Waxing (for classic skis) is happening again – details to come. Costumes are welcomed and encouraged! Many describe the event as the Mardi Gras of the North, thanks to the creative spirit and enthusiasm of our participants. We’re all ready for some color after our dark Alaska winters. Medal Ceremony & Costume Awards 12:00 pm – Great prizes for racers and costume contestants. 1st, 2nd, and 3rd place awards for Skate Race, Classic Race and the Duathalon. The Party Waves are for those who are out to have fun on the trails—most people, we expect. The point is to enjoy your trail-mates, meet the people in the cow costume and to have a great time. Costume Parade 11:45 Gather in the stadium at 11:30. Parade will be at 11:45, judging and awards start at 12:00. Costume prizes will be for best duo, best kids, and best overall. White Bibs 12:15 This wave will be filled on a first come first served basis. People that want to move faster should position themselves at the front of the wave. 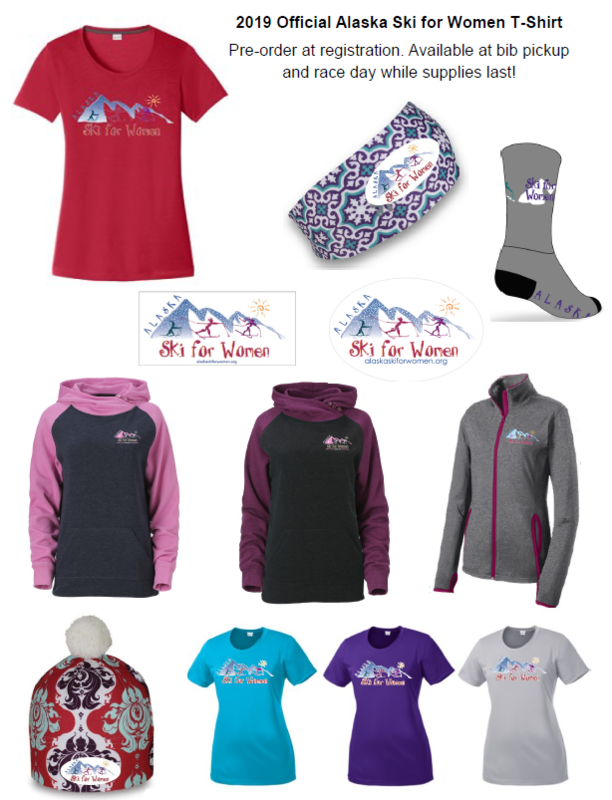 Alaska Ski for Women merchandise will be available for purchase at the In-person/late-registration at REI as well as on race day. Merchandise sells out fast. Check out the merchandise online when registering, at bib pick-up and on event day, while supplies last! We also have lots of auction items donated every year. Stop by the Kincaid Chalet on race day to check out the wide variety of items you can bid on. 100% of the net proceeds go to help stop the cycle of domestic violence. 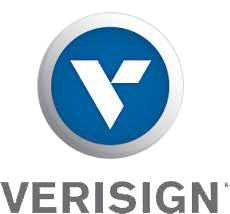 Cash, Check, Visa, MC, Discover and AMEX accepted! Additional Alaska Ski for Women merchandise available while supplies last! The ASFW is designated one of the four Triple Patch women’s sporting events in Alaska. The Triple Patch program provides a classy, distinctive patch awarded to women and girls who complete three of the four designated sporting events in one calendar year. Participation in the Party Wave is counted towards the patch, but participants must insure that the tear-off portion of your bib is taken at the finish line. Complete all four events in the same year and receive a special pin for your patch! What are the four events? The Alaska Ski for Women (ASFW) was started in 1997 by the Event’s Founding Mothers Ann Mize and Sally Burkholder, both of whom are very accomplished skiers. Ann and Sally noticed a lot of women skied on the wonderful Anchorage ski trails but did not come out to join in the local ski races. They set forth to create a fun event that would eliminate all of the excuses women often come up with to not participate in ski races; for example, not having a partner to ski with, the men are too aggressive in races and my skis aren’t waxed. The ASFW is just for women, free ski waxing is provided and it is a fun and relaxing atmosphere in which to participate…plus proceeds to go to a good cause. Why Super Bowl Sunday? Believe it or not the Founding Mothers did not intentionally select Super Bowl Sunday for the first year’s event date. Anchorage is blessed with many wonderful Nordic ski races so when they reviewed the racing calendar they simply picked the only available date – Super Bowl Sunday. It wasn’t until well after the event was planned that the Founding Mothers realized what date their new event was on. After the inaugural year, it is now tradition to always hold the event on that famous football date. Women can ski in the morning and watch the Super Bowl in the afternoon! Costumes are welcomed and encouraged! Many describe the event as the Mardi Gras of the North, thanks to the creative spirit and enthusiasm of our participants. We’re all ready for some color after our dark Alaska winters. Come in costume or no costume at all – either way you will never forget this event! Gather in the stadium area at 11:30 am. Participants will parade around the stadium area at the bottom of the hill from the chalet. Judging will start at 11:45 and awards will be at 12. The party wave will start after that at approximately 12:15. The party wave is not a race, if you want to go a little faster, you may want to make sure line up towards the front of the wave. Remember, costumes are not just for the party wave – everyone that is on skis can be in costume! We always suggest that participants car pool when possible. With over 1,200 women and children racing, being prepared and on time is important. Parking and a porta pottie is available at Kincaid Elementary. Premier Tours will be providing coach buses that will wisk you and your skis to the chalet. There is limited parking at the chalet and the outer lots, but it fills up fast. Please follow the instructions of our great parking volunteers. Buses will start running at 9:00am and continue until 1:30 pm.